Walnut trees are any species of tree in the plant genus Juglans, the type genus of the family Juglandaceae, the seeds of which are referred to as walnuts. All species are deciduous trees, 10–40 metres (33–131 ft) tall, with pinnate leaves 200–900 millimetres (7.9–35.4 in), with 5–25 leaflets; the shoots have chambered pith, a character shared with the wingnuts (Pterocarya), but not the hickories (Carya) in the same family. The generic name comes from Latin jūglans, meaning 'walnut, walnut tree'; jūglans in turn is a contraction of Jōvis glans, 'nut of [the god] Jupiter'. Tradition has it that a walnut tree should be beaten. This would have the benefit of removing dead wood and stimulating shoot formation. In 2014, global production of walnuts (in shell) was 3.5 million tonnes, led by China with 46% of the world total (table). Other major producers were the United States and Iran (table). The leaves and blossoms of the walnut tree normally appear in spring. The male cylindrical catkins are developed from leafless shoots from the past year; they are about 10 cm (3.9 in) in length and have a large number of little flowers. Female flowers appear in a cluster at the peak of the current year’s leafy shoots. Two-thirds of the world export market[how?] and 99% of US walnuts are grown in California's Central Valley and in Coastal Valleys, from Redding in the north to Bakersfield in the south. Of the more than 30 varieties of J. regia grown there, Chandler and Hartley account for over half of total production. 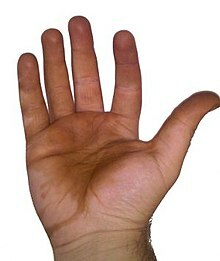 In California commercial production, the Hinds' black walnut (J. hindsii) and the hybrid between J. hindsii and J. regia, Juglans x Paradox, are widely used as rootstocks for J. regia cultivars because of their resistance to Phytophthora and to a very limited degree, the oak root fungus. However, trees grafted on these rootstocks often succumb to black line. The common walnut, and the black walnut and its allies, are important for their attractive timber, which is hard, dense, tight-grained and polishes to a very smooth finish. The colour ranges from creamy white in the sapwood to a dark chocolate in the heartwood. When kiln-dried, walnut wood tends toward a dull brown colour, but when air-dried can become a rich purplish-brown. Because of its colour, hardness and grain, it is a prized furniture and carving wood. Walnut burls (or "burrs" in Europe) are commonly used to create bowls and other turned pieces. Veneer sliced from walnut burl is one of the most valuable and highly prized by cabinet makers and prestige car manufacturers. Walnut wood has been the timber of choice for gun makers for centuries, including the Gewehr 98 and Lee–Enfield rifles of the First World War. It remains one of the most popular choices for rifle and shotgun stocks, and is generally considered to be the premium – as well as the most traditional – wood for gun stocks, due to its resilience to compression along the grain. Walnut is also used in lutherie and for the body of pipe organs. The wood of the butternut and related Asian species is of much lower value, softer, coarser, less strong and heavy, and paler in colour. In North America, forestry research has been undertaken mostly on J. nigra, aiming to improve the quality of planting stock and markets. In some areas of the US, black walnut is the most valuable commercial timber species. The Walnut Council is the key body linking growers with scientists. In Europe, various EU-led scientific programmes have studied walnut growing for timber. Bride (Catocala neogama) – nominate subspecies on butternut and others, C. n. euphemia on Arizona black walnut, perhaps Texas black walnut and others. In California (US) and Geneva (Switzerland), ravens have been witnessed taking walnuts into their beaks, flying up to 60 feet or so in the air, and dropping them to the ground to crack the shells and eat the nut inside. The raw edible seed of walnut is composed of 4% water, 14% carbohydrates, 15% protein, and 65% fat. In a 100 gram amount, walnuts provide 654 calories and are a rich source (20% or more of the Daily Value) of protein, dietary fiber, the B vitamins, niacin, vitamin B6, and folate, and several dietary minerals, particularly manganese. Walnut oil is composed mostly of polyunsaturated fatty acids, particularly alpha-linolenic acid and linoleic acid, although it also contains oleic acid, a monounsaturated fat and 31% of total fat is saturated fat. Leaves are very large (40–90 cm), with 11–19 broad leaflets, softly downy, margins serrated. The wood is soft, and the fruits borne in racemes of up to 20. The nuts have thick shells. Native to northeast Asia. Leaves are large (20–45 cm), with 5–9 broad leaflets, hairless, margins entire. The wood is hard. Native to southeast Europe to central Asia. J. hirsuta Manning Nuevo León walnut Mexico. Texas, New Mexico, Oklahoma, and Kansas. J. nigra L. Eastern black walnut southern Ontario, west to southeast South Dakota, south to Georgia, northern Florida and southwest to central Texas. Leaves are very large (40–90 cm), with 11–19 broad leaflets, softly downy, margins serrated. The wood is soft. Fruits are borne in clusters of two to three. The nuts have a thick, rough shell bearing distinct, sharp ridges. Native to eastern North America. The butternut (J. cinerea) is also native to eastern North America, where it is currently endangered by an introduced disease, butternut canker, caused by the fungus Sirococcus clavigignenti-juglandacearum. Its leaves are 40–60 cm long, the fruits are oval, the shell has very tall, very slender ridges, and the kernel is especially high in fat. ^ "Tropicos | Name - Juglans L." www.tropicos.org. Retrieved 29 June 2016. ^ "walnut". The American Heritage Dictionary of the English Language. Houghton Mifflin. Retrieved 10 February 2014. ^ "Online Etymology Dictionary". Etymonline.com. Retrieved 2015-07-16. ^ jūglans. Charlton T. Lewis and Charles Short. A Latin Dictionary on Perseus Project. ^ glans. Charlton T. Lewis and Charles Short. A Latin Dictionary on Perseus Project. "an acorn, and, in gen., any acorn-shaped fruit, beechnut, chestnut, etc." ^ Ursula Buchan (4 October 2003). "Beat them as hard as you can". The Daily Telegraph. ^ "Crops/Regions/World list/Production Quantity (pick lists), Walnuts (in shell), 2014". UN Food and Agriculture Organization, Corporate Statistical Database (FAOSTAT). 2016. Retrieved 24 May 2017. ^ "Fruit and Nut Trees – Fruit Bearing Plants " Blog Archive " Walnut Tree - Juglans regia – Juglans nigra". Fruitandnuttrees.com. Archived from the original on 2009-04-30. Retrieved 2015-07-16. ^ J. Derek Bewley; Michael Black; Peter Halmer (2006). The Encyclopedia of Seeds: Science, Technology and Uses. CABI. p. 250. ISBN 9780851997230. ^ "Walnuts" (PDF). USDA. Archived from the original (PDF) on October 18, 2012. Retrieved 2015-07-16. ^ "Walnut Council--Growing Walnut and Other Fine Hardwoods". Walnutcouncil.org. Retrieved 2015-07-16. ^ a b c "Nutrition facts: Nuts, walnuts, English, per 100 g". Condé Nast for the US Department of Agriculture National Nutrient Database, Standard Release 21. 2014. Retrieved 4 July 2014. ^ D. Stone, S. Oh, E. Tripp, Luis. Gios, P. Manos: "Natural history, distribution, phylogenetic relationships, and conservation of Central American black walnuts (Juglans sect. Rhysocaryon)", Journal of the Torrey Botanical Society 136(1)1–25. 2009. 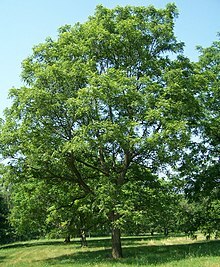 Wikimedia Commons has media related to Juglans.